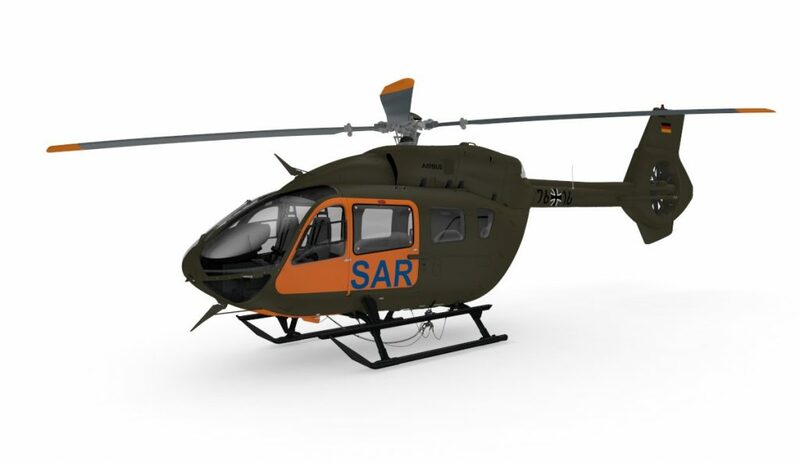 Seven Airbus H145 helicopters have been ordered to replace the German Armed Forces’ Bell UH-1D search-and-rescue fleet, which first entered into service in the early 1970s. The new aircraft, ordered through the Federal Office of Bundeswehr Equipment, Information Technology and In-Service Support, will be delivered to the German Armed Forces (Bundeswehr) in 2020. The helicopters will be stationed at sites in Niederstetten, Holzdorf and Nörvenich. Airbus Helicopters will also be responsible for logistics support, repair, and maintenance of the helicopters. Bundeswehr is already operating the military version of the H145, H145M, from a previous order that saw deliveries begin in 2015. According to an agreement with the Federal Ministry of Transport, the Bundeswehr is also responsible for search-and-rescue operations in the event of aircraft accidents on German territory. Airbus explains Bundeswehr, therefore, maintains a fleet of search-and-rescue helicopters on permanent standby; and these helicopters are also available for use in national disaster management operations. The H145 LUH SAR (Light Utility Helicopter Search and Rescue) helicopters are equipped with high-performance cameras, searchlights, emergency beacon locator systems, a suite of medical equipment, rescue winches, and load hooks that can be used for fire-extinguishing tanks, for example. The H145M military version of the aircraft is a light twin-engine helicopter that, again, was first delivered to the Bundeswehr in 2015 and has since also been ordered by Serbia, Hungary, Thailand and Luxembourg. Mission readiness of the H145Ms already in service, according to Airbus, is above 95 per cent. At its site in Laupheim, the Bundeswehr operates 15 H145Ms as light support helicopters for special forces. The helicopter pilots of all branches of the armed forces train on the H135, described by Airbus as the H145’s ‘little sister’. Powered by two Safran Arriel 2E engines, the H145 is equipped with full authority digital engine control (FADEC) and the Helionix digital avionics suite. It includes a high-performance 4-axis autopilot, designed to increase safety and reducing pilot workload.